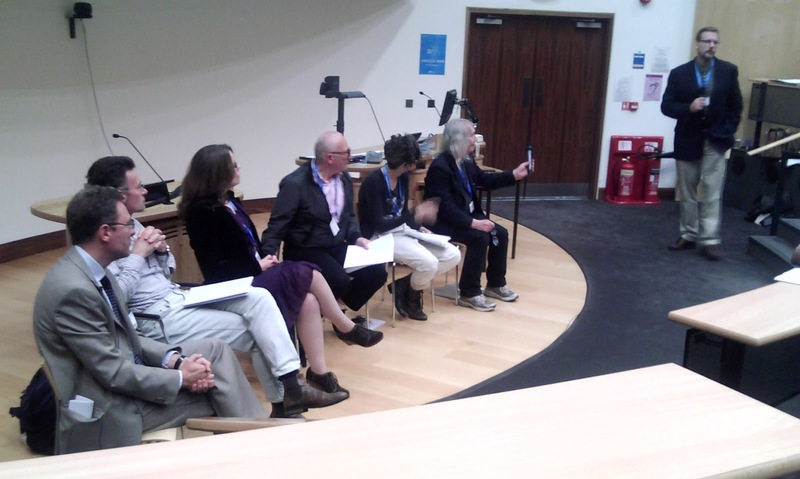 Monday and Tuesday this week I spent at the AISB/IACAP World Congress (Turing 2012), at Birmingham University. (The event is continued all week, but I just went for the two days.) It was very worthwhile - many thanks to the organisers - and I've come away with lots to think about and, in an ideal world, blog about. - Floridi's 'Level of Abstraction' (LoA). I agree with his emphasis of the utility of the idea, but I call it a map rather than an LoA. - The Big Picture about information - paradigm shift? Grand narrative? Philosophia prima? - Suzanne Embury on "Forget Dimensions, Define your Information Quality Using View Patterns". About a specific task to do with information quality, but surely links to all sorts of ontologies. The 'Author meets Critics' session, when five eminent academics gave comment (it could hardly be called 'criticism' in any sense, to be fair!) on Luciano Floridi's excellent new book: "The Philosophy of Information" (from the left: Luciano Floridi; James Cussens; Phyllis Illari; Jean-Gabriel Ganascia; Chryssa Sdrolia and Barry Cooper).